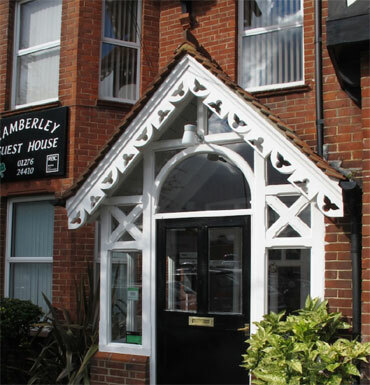 Camberley Guest House can be found just five minutes from the town centre and Camberley Mainline Station. A30/London Road location makes it a practical for all major routes. This small and friendly family run guest house certainly wins some worthy recommendations from previous guests with folks generally applauding its 'high standards of cleanliness' and the 'excellent breakfast'. Suitable for families and business folks alike, this seven bedroom guest house offers tea and coffee making facilities, a hair dryer and a private bathroom. A desk, a radio and a flat-screen TV can also be found in each room. All rooms are ensuite and a full cooked breakfast is provided. Camberley Mainline Station is within walking distance and local attractions like the the theatre and Surrey Heath Museum are just across the road. Off street parking available. Children and families are welcome. Contact the owners on 01276 24410 to check room availability.